The Su-25 Frogfoot, known as the Grach or “Rook” by Russian pilots, is one of those aircraft that may not be at the cutting edge of technology, but still has seen widespread service around the world because it offers an effective and useful solution to the need to blast targets on the ground. As such, its obvious stablemate is the American A-10 Thunderbolt II attack plane. But while the U.S. Air Force wants to retire the A-10 starting in 2022, the Su-25 is undergoing extensive upgrades to keep with the times. Also unlike the Thunderbolt, it has been disseminated it all over the world and seen action in over a dozen wars, including in the air campaigns over Syria, Iraq and Ukraine. 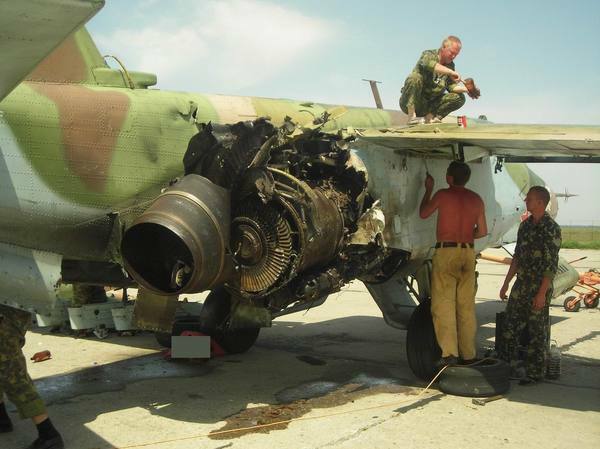 Not only has Russia had a lot of experience flying Su-25s in combat—it has shot several down as well. During World War II, Russia’s armored Il-2 Sturmovik attack planes, nicknamed “Flying Tanks,” were renowned for their ability to take a pounding while dishing it out to German Panzer divisions with bombs, rockets and cannon fire. In 1968, the VVS service decided it was time for another properly designed flying tank. After a three-way competition, the prototype submitted by Sukhoi was selected and the first Su-25 attack planes entered production in 1978 in a factory in Tbilisi, Georgia. Coincidentally, the American A-10 Thunderbolt had begun entering service a few years earlier. Like the A-10, the Su-25 was all about winning a titanic clash between the ground forces of NATO and the Warsaw Pact by busting tanks and blasting infantry in Close Air Support missions. This meant flying low and slow to properly observe the battlefield and line up the plane for an attack run. Flying low would also help the Su-25 avoid all the deadly long-range SAMs that would have been active in a European battlefield. However, this would have exposed it to all kinds of antiaircraft guns. Thus, the pilot of the Su-25 benefited from an “armored bathtub”—ten to twenty-five millimeters of armor plating that wrapped around the cockpit and even padded the pilot’s headrest. It also had armored fuel tanks and redundant control schemes to increase the likelihood of surviving a hit. And in their extensive combat careers, Su-25s have survived some really badhits. Despite the similarities with the A-10, the Su-25 is a smaller and lighter, and has a maximum speed fifty percent faster than the Thunderbolt’s at around six hundred miles per hour. However, the Frogfoot has shorter range and loiter time, can only operate at half the altitude, and has a lighter maximum load of up to eight thousand pounds of munitions, compared to sixteen thousand on the Thunderbolt. More importantly, the types of munitions usually carried are typically different. The Thunderbolt’s mainstays are precision-guided munitions, especially Maverick antitank missiles, as well as its monstrous, fast-firing GAU-8 cannon. The Su-25’s armament has typically consisted of unguided 250 or 500 kilogram bombs, cluster bombs and rockets. The rockets come in forms ranging from pods containing dozens of smaller 57- or 80-millimeter rockets, to five-shot 130-millimeter S-13 system, to large singular 240- or 330-millimeter rockets. The Su-25 also has a Gsh-30-2 30-millimeter cannon under the nose with 260 rounds of ammunition, though it doesn’t have the absurd rate of fire of the GAU-8. The lower tip of the Frogfoot’s nose holds a glass-enclosed laser designator. Su-25s did make occasional use of Kh-25ML and Kh-29 laser guided missiles in Afghanistan to take out Mujahideen fortified caves, striking targets as far as five miles away. KAB-250 laser-guided bombs began to see use in Chechnya as well. However, use of such weapons was relatively rare. For example, they made up only 2 percent of munitions expended by the Russian Air Force in Chechnya. The Su-25 was still packing plenty of antipersonnel firepower—and that’s exactly what was called for when it first saw action in Afghanistan beginning in 1981. The Su-25 was the workhorse fixed-wing attack plane in the conflict, flying more than sixty thousand sorties in bombing raids on mujahedeen villages and mountain strongholds. They often teamed up with Mi-24 attack helicopters to provide air support for Soviet armored units. However, as the Afghan rebels began to acquire Stinger missiles from the United States, Su-25s began to suffer losses and the Soviet pilots were forced to fly higher to avoid the man-portable surface-to-air missiles. In all, some fifteen Su-25s were shot down in Afghanistan before the Soviet withdrawal. With the dissolution of the Soviet Union, Su-25s were passed onto the air services of all the Soviet successor states. Those that didn’t use Su-25s in local wars—on both sides of the Nagorno-Karabakh conflict, for example—often exported them to countries that did. Frogfoots have seen action in the service of Macedonia (against Albanian rebels), Ethiopia (against Eritrea, with one shot down), Sudan (target: Darfur), and Georgia versus Abkhazian separatists that shot down several. And that list is not comprehensive. In one notable episode, Cote d’Ivoire acquired several Su-25s and used them in its civil war. When the government of President Laurent Gbagbo was angered by the perceived partisanship of French peacekeepers, his mercenary-piloted Su-25s bombed the French camp, killing nine. Whoever ordered the attack didn’t consider that there was a French contingent stationed at the Yamoussoukro Airfield where the Frogfoots were based. The French used anti-tank missiles to destroy the fighter bombers on the ground in retaliation. Russian Su-25 were back in action in the Chechnya campaign of 1994 to 1995, flying 5,300 strike sorties. Early on they helped wipe out Chechen aircraft on the ground and hit the Presidential Palace in Grozny with anti-concrete bombs. They then pursued a more general bombing campaign. Four were lost to missiles and flak. They were again prominent in the Second Chechen War in 1999, where only one was lost. Of course, it’s important to note at this juncture that the Su-25 is one of a handful of Soviet aircraft that received its own American computer game in 1990. In addition to the base model, the Frogfoot also came in an export variant, the Su-25K, and a variety of two-seat trainers with a hunchback canopy, including the combat-capable Su-25UBM. There were a number of projects to modernize the Su-25, including small productions runs of Su-25T and Su-25TM tank busters. But the Russian Air Force finally selected the Su-25SM in the early 2000s for all future modernization. The SM has a new BARS satellite navigation/attack system, which allows for more precise targeting, as well as a whole slew of improved avionics such as news heads-up displays (HUDS), Radar Warning Receivers and the like. The Su-25SM can use the excellent R-73 short-range air-to-air missile, and has improved targeting abilities for laser-guided bombs. Other improvements reduce maintenance requirements and lower aircraft weight. The National Interest’s Dave Majumdar has written about the latest SM3 upgrade, which includes the capacity to fire Kh-58 anti-radar missiles, which could enable Su-25s to help suppress enemy air defenses, as well as a Vitebskelectronic-countermeasure system that could increase its survivability against both radar- and infarred-guided surface to air missiles. Georgia and Ukraine also have limited numbers of their own domestically upgrade variants, the Su-25KM and the Su-25M1 respectively. You can check out the Su-25KM variant, produced with an Israeli firm, in this video full of unironic 1980s flair. Speaking of Georgia, things got messy in 2008 when both Russia and Georgia operated Frogfoots in the Russo-Georgian War. The Georgian Frogfoots provided air support for Georgian troops seizing the city of Tskhinvali. Then Russian Su-25s assisted Russian armor in blasting them out. Russia lost three Su-25s to MANPADS—two likely from friendly fire—and Georgia lost a similar number to Russian SAMs. To the surprise of observers, however, the Russian Air Force did not succeed in sweeping Georgian aviation from the sky. In 2014, Ukraine deployed its Frogfoots to support ground forces combating separatist rebels in Eastern Ukraine. They assisted in the initial recapture of the Donetsk airport in May, would be followed over a half year of seesaw battles ending in a separatist victory in 2015. Ukraine lost four Su-25s in the ensuing ground-attack missions—three were hit by missiles (one MANPADS, two allegedly by longer-ranged systems across the Russian border), and a fourth was reportedly downed by a Russian MiG-29. Two others survivedhits from missiles. As a result, Su-25 strikes were sharply curtailed to avoid incurring further losses. In 2015, the Russian separatists of the Luhansk People’s Republic claimed to have launched airstrikes with an Su-25 of their own. Depending on who you ask, the airplane was restored from a museum or flew in from Russia. The Iraqi Air Force has deployed its own Su-25s in the war against ISIS, purchasing five from Russia in 2014 and receiving seven from Iran that had been impounded during the 1991 Gulf War. Finally, in the fall of 2015, Russia deployed a dozen modernized Su-25SMs in support of the Syrian government of Bashar al-Assad. Many observers noted that of the aircraft involved in the mission, the Su-25s were the best adapted for the close air-support role. The Frogfoot flew 1,600 sorties against rebel-held Syrian cities, and expended more than six thousand munitions, mostly unguided bombs and S-13 rockets. They were withdrawn this year, leaving attack helicopter behind to perform more precise—and risky—close air support missions. Lessons Learned from Flying Tanks? While it’s fun to admire high-performing fighters like the MiG-29 or F-22 Raptor, the unglamorous Su-25 has so far had a greater impact on a wide range of conflicts. We can draw a few lessons from its recent combat record. First, the significant losses suffered by Su-25s demonstrate that without effective air-defense suppression and electronic counter-measures, low-and-slow ground support planes are poised to take heavy losses against Russian-made surface-to-air missiles deployed in sufficient numbers. Second, observation of Russia’s Syrian contingent suggests that despite possessing a diverse arsenal of precision guided munitions, the Russian Air Force continues to rely primarily on unguided bombs and rockets for the close air support mission. Lastly, aircraft capable of delivering punishing attacks on ground targets while retaining a good chance of surviving hits taken in return are going to remain in high demand worldwide. [Image](: An Su-25 in flight. Photo by Fedor Leukin, CC BY-SA 2.0.